Bhagawan has often been heard to tell the words, “Do I need to invite you to your own mother’s house?” There is no power as magnetic as Mother’s love. No wonder then that thousands thronged the Easwaramma – Pedda Venkama Raju Samadhi Mandir this morning on the holy occasion of Easwaramma day. The programme started at 0800hrs simultaneously in both Sai Kulwant Hall and Samadhi Mandir with Vedam and Bhajans respectively. Many elders of the ashram who have had the blessing of having known and interacted with her in close proximity offered their respects to the Divine Mother. The descendants of the Divine Parents then offered flowers and broke coconuts at the Samadhi. Arati was offered in Samadhi Mandir at 0830hrs after which Sweet Pongal and Tamarind Rice was distributed to the assembly. The added special ingredient of mother’s love made the prasadam even more delicious on this day. The programme then shifted to Sai Kulwant Hall with 9 cows being brought in a procession led by Panchavadhyam. 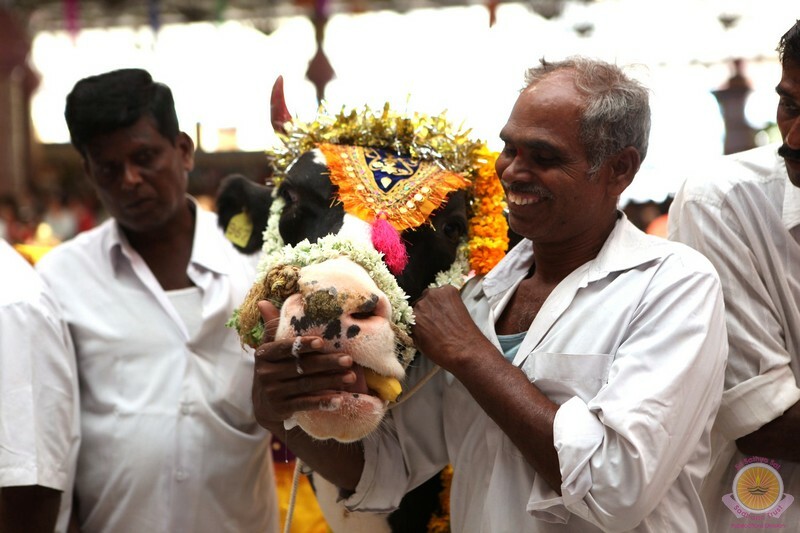 A total of 54 cows were donated on this auspicious occasion with 9 of them being symbolically given away in the Sai Kulwant hall while the rest was given in the Gokulam. The beneficiaries prostrated at the Sanctum Sanctoram even as Prof Anil Kumar announced their names. The deserving candidates were selected from various nearby villages including Paipalli, Venkatagari, Jagaraju Palli, Gunti Palli, Kambalapalli and so on. The distribution was followed by Bhajans and Arati. “I am installed where ever My Glory is sung”, is a time tested declaration of Bhagawan and which has been experienced by His devotees across the world. With that theme in mind, Dr. Dwaram Lakshmi accompanied by some of the alumni from the Sri Sathya Sai Mirpuri College of Music enthralled the audience with classical songs in various languages. The highlight of the programme were the special aalaps on Mother Easwaramma and Buddha Purnima specifically composed for the occasion by Sri Prakash Rao. Today also marked the conclusion of the three day conference of the Sri Sathya Sai Vidya Vahini Project. The delegates of the conference offered their gratitude at the Sanctum Sanctorum even as the Bhajans were going on. Prasadam was distributed to the assembly. This day (6th May 2011) being Easwaramma Day and the 13th day after Bhagawan shed His mortal coil and became the all-pervading Universal Consciousness, a special function was arranged in the Sri Sathya Sai Hill View Stadium to feed the Narayanas (feeding of the poor and forlorn). It was rightly named as Maha Narayana Seva. Elaborate arrangements were made in the stadium to feed the Narayanas in an orderly manner. The stadium was barricaded well so that the Narayanas could sit comfortably and partake of the Prasadam and receive clothes. The local administration had provided the Police force in good numbers to send the Narayanas in a single file to the stadium. The Seva Dals of Sri Sathya Sai Seva Organisation too manned the important locations in the stadium and helped in the smooth conduct of the function. The function began at 9.30 hrs. with the lighting of lamp in the dais of the stadium. Two huge photographs, one of Bhagawan and another of Mother Easwaramma wa s placed on the dais. A beautiful cut-out of Bhagawan serving the Narayanas in the Hill View Stadium was arranged as a backdrop. The Narayanas were allowed in the stadium from 7.00 hrs. to 9.30 hrs. People had lined up outside the stadium as early as 6.00 hrs in the morning to gain entry. The Narayanas were served a laddu, Puliohara (Tamarind rice) in adequate quantities, water sachets, clothes, Vibhuti Prasadam and a photograph of Bhagawan. By 9am the whole stadium was full. As there was no announcement or bhajans sung till then, it was so nice to see poor villagers, forming small groups and singing bhajans. By 9am the whole stadium was full. As there was no announcement or bhajans sung till then, it was so nice to see poor villagers, forming small groups and singing bhajans. Those bhajans are very identical to Prasanthi Bhajans, (not bilittling the students) but when the villagers sang, it sounded very different and nice Probably because of the kind of innocence with which these bhajans are sung. All the Trustees of Sri Sathya Sai Central Trust were present on this occasion. The function concluded at 10.00 hrs with the offer of Arati. Meanwhile, at the Mother Easwaramma Samadhi, special prayers and offerings were conducted in the morning that was attended by Bhagawan's ' family' members, students and devotees. The evening session had three elders sharing their experience with the devotees. Prof. Anil Kumar who introduced the speakers of the day, hailed mother Easwaramma by quoting Bhagawan's own declaration that Rama, Krishna, Shivaji or Gandhi became what they were because of their mothers. Same way, I am Sathya Sai today because of Easwaramma! The first speaker was Prof. G. Venkataraman, the 5th Vice Chancellor of Bhagawan's University and the current head of Radio Sai Global Harmony. Prof. Venkataraman spoke about how all who gatghered are writing a public exam this day. We had an inspiring and loving teacher to guide us throughout but the teacher can't be with us during the exam. We have to make our teacher proud by performing with flying colours in this exam, he insisted. He then reminded the assembly of a past discourse when Bhagawan admonished devotees for running after Moksha when the fellow human beings were suffering. Bhagawan thundered that His devotees should run to the help of his fellow brothers so that God would run behind them to grant Moksha. However the professor cautioned the gathering that it is our heart which should lead the head and not vice versa. Sri B N Narasimhamurthy, the warden of the Brindavan campus was the next speaker. He recollected the words of John the beloved disciple of Jesus, " YOU WOULD HAVE me speak of Jesus, but how can I lure the passion-song of the world into a hollowed reed? Could you conceive a majesty too kind to be majestic? And a beauty too radiant to seem beautiful? Could you hear in your dreams a voice shy of its own rapture?". Recaptulating the last moments of Lord Krishna and Shirdi Sai , the speaker attempted to console the devotees of the Permanence of the Avatars. The third speaker Sri V.S.R. Murthy, is the managing director of a private firm in Hyderabad. He addressed the gathering in Telugu. Starting with hailing Mother Easwaramma mentioning about her requests to her son that led to Bhagawan staying in Prasanthi Nilayam and transforming this forlorn village into an international township with a university of repute and a super specialty hospital, the speaker drew drew attention to how Bhagawan, the Avatar of the age, set us all an example by always listening to His mother, nourishing His motherland and elevating His mother tongue to a language of God. He further narrated a personal interaction he had with Bhagawan. Bhagawan had said that any home in which a small photo of His is placed, where bhajans are sung, where the residents leave all burdens to Him and live life in surrender, Bhagawan would take complete care of the family for many generations. Prof. Anil Kumar thanked the speakers and made special mention of the morning's Maha Narayana Seva which happened with such auspiciousness that one felt Bhagawan walking between the lines and serving every guest Himself. He then introduced the artistes for the evening. The Malladi Brothers who have given many scintillating concerts in the Divine Presence in the recent years sang many favourite numbers of Bhagawan. They also shared some interactions they had with Bhagawan during their first performance in front of the Lord in Kodaikanal. They started their concert with Ram Bhakthi Samrajyam. When they sang "Janula Madhya Tirugade Jagapathi", there were few dry eyes in the hall. They concluded the concert with the famous song, "O Rama Ne Naamam Yemmi Ruchi Ra..."
The concert was followed by Bhajans during which prasadam was distributed to the assembly. The programme concluded with Mangala Aarathi at 1935 hrs. A special announcement on tomorrow's Easwaramma Day programme was made this evening at the end of bhajan session. On the auspicious occasion of Easwaramma Day, 'Maha Narayana Sev a' will be conducted in Sri Sathya Sai Hill View Stadium tomorrow morning. Gates of the stadium will be kept opened from 0700 hrs. till 0930 hrs. during which food and clothes will be distributed as part of the programme. Inmates and visitors of Ashram can partake their food from 1030 hrs. at the South Indian Canteen. In the evening, a special congregation will be held honouring the occasion wherein elders will share their experiences that will be followed by a Carnatic concert by Malladi Brothers. May 6, 2009: Easwaramma Day is the day dedicated to the Pristine Motherhood of Easwaramma who was the chosen mother assigned with the rarest of the privileges granted by the Greater Heaven to bring the Bundle of Joy, the Avatar of the Age, Bhagawan Sri Sathya Sai Baba unto planet earth. This was the day when the Mother of the Avatar shed her mortal coil attaining the Supreme. Aptly remembering the mother and her greater love towards children, during the golden jubilee celebrations of Bhagawan’ Advent, the World Council of Sri Sathya Sai Seva Organisations announced that henceforth the day would be celebrated as Children’s Day by the organization worldwide. Children should recognise the supremacy of maternal love, which is equal to Divine Love. Revere and love the mother. The parents are living symbols of God. Children must make them happy, said Bhagawan during one such occasion when His mother was commemorated; rightly sending the greater message “My Life is My Message”, urging one and all to learn from the Avatar’s life following His precepts to lead an exemplary life loving and serving parents with love and gratitude. Every year 6th of May is celebrated as Easwaramma Day in Prasanthi Nilayam. After a gap of many years from last year onwards Bhagawan has been gracious to bless this event with His physical presence. Elaborate arrangements were made for this occasion, and the whole area leading to the Samadhi Mandir was spruced up. Large number of devotees had lined up both sides of the road right from early in the morning to get a glimpse of Bhagawan. A beautiful picture of Mother Easwaramma adorned the dais in Sai Kulwant Hall ensconced beautifully in flowers. Portraits of the Divine Mother also adorned the pillars of the hall. The dais was decorated beautifully with flowers. Bhagawan came to Sai Kulwant Hall at 9.00 a.m. and proceeded straight to the Samadhi Mandir. The Samadhi of the Divine Parents Smt. 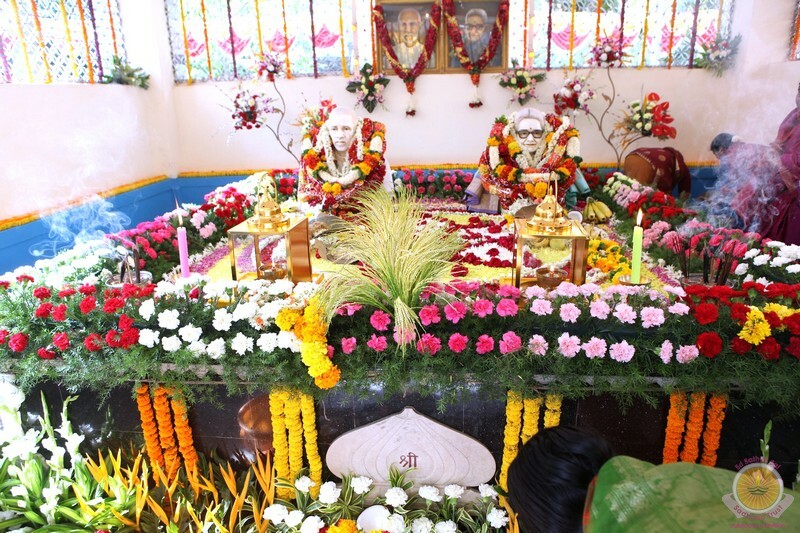 Easwaramma and Sri Pedda Venkama Raju was also decorated beautifully with flowers. Alighting from the car upon reaching the Samadhi Mandir, Bhagawan blessed silk dhotis, silk sarees and angavastrams to be placed on the Samadhi. Bhagawan has declared, “My Life is My Message”. It was a sight to watch Bhagawan setting an ideal to the world that one should never forget one’s parents and should remember them with gratitude. Bhagawan also blessed a gold chain studded with gemstones specially made for this occasion. The gold chain was subsequently decorated on the Samadhi of Mother Easwaramma. Bhagawan went round the Samadhi and blessed the family members who had gathered in large numbers at the venue. After Arati was offered to Bhagawan, He returned to Sai Kulwant Hall at 9.40 a.m and went for a full round granting the bliss of Divine Darshan. Vedic chanting continued for some time before Aarthi was offered. Sumptuous Prasadam of Pulihora (tamarind rice) and sweet Pongal was served to the entire congregation of devotees. Bhagawan retired for the morning session at 9.55 a.m. In the evening the stage was set for Burra Katha, a typical Andhra style storey telling format. Bhagawan came at 4:45 p.m., moved for a full round before coming on to the dais. The programme commenced with a traditional offering to Lord Ganesha, the remover of all obstacles. As they started their song on Swami, each of them was garlanded. The song ran thus: “The words of Sai are verily the Vedas for the world …” The topic of Burra Katha for this day was Mother Easwaramma. Hailing victory to Mother Easwaramma, the students gave a brief chronology of events in her life. That she was born in the year 1890 to Sri Subba Raju. When she was only five years old, the family migrated to Puttaparthi. It was the good fortune of Mother Easwaramma that she could be the mother of Easwara (God) Himself. Her name now finds a place in the list of illustrious mothers of Avatars – Kausalya gave birth to Sri Rama, Devaki to Sri Krishna and Devagiriamma to Shirdi Sai. Bhagawan was born in the Ratnakara Vamsa (clan) to Pedda Venkama Raju and Easwaramma. Continuing their narration, the students said, it was Subbamma who named Bhagawan as Sathyanarayana Raju. As a youngster, Swami used to give toffees and items of daily need to His classmates. When His classmates asked Swami as to where He got those articles from. Bhagawan used to reply that the Grama Devata (goddess of the village) was giving Him. The students kept their narration lively by interspersing it with songs and witty dialogues. Switching their narration to Karanam Subbamma, they said Karanam Subbamma was the first wife of Narayana Rao. One day when Subbamma wanted to feed Pakodas to Swami, she saw all the fourteen worlds in His mouth as Yashoda saw in Lord Krishna’s mouth in the Dwapara Yuga. Karanam Subbamma experienced great joy in serving food to the devotees of Bhagawan, they said. Referring to the three wishes of Mother Easwaramma, the students said the present Sri Sathya Sai University, Super Speciality Hospitals and Sri Sathya Sai Ganga Water Project bore fruit due to the humble wishes of Mother Easwaramma. In those days, Bhagawan used to do Narayana Seva to the villagers of surrounding villages. He used to ask Mother Easwaramma to distribute clothes. On this day in 1972, when the Summer Course was in progress in Brindavan, Bangalore, she left her mortal coil. When Swami was not physically present with her, she called out, “Swami, Swami …” And Swami responded, came to her, and she breathed her last. The Burra Katha artistes said that though 37 years have passed, Mother Easwaramma is still ever fresh in everyone’s minds. Recently in Kodaikanal, Bhagawan inaugurated a Pancha Loha statue (made of five metals) of Mother Easwaramma. The artistes concluded by expressing gratitude to Mother Easwaramma for those three wishes which fructified into gigantic projects. At the end of their presentation, Bhagawan asked Sri B.N. Narasimha Murthy, Warden, Brindavan Campus to announce the names of the Burra Katha artistes – Sri Prabhakar, the main narrator, Sri Arvind Sai, the student responsible for the comic element, Sri Raghuram, who assisted in the presentation. This was followed by a brief bhajan session and Aarathi. He had specified that it would be the narrative of Karnam Subamma and Easwaramma. How apt! While Easwaramma, like Devaki the mother of Lord Krishna, was the chosen first "home" of the Avatar, Karnam Subamma, like Yashoda, was chosen to play with and raise the Avatar in all love. And a burra katha on both these wonderful and wonder-witnessing women was to be performed. In the morning, Swami made a visit to the Samadhi of His parents, Easwaramma and Pedda Vankamma Raju. The narrow lane leading up to the samadhi had been cleaned and paved with buntings and decorations. All the shops en route were shut and people lined up against the roads to catch a glimpse, and if possible something more too, of Swami as He passed by. The samadhi premises had been opened only to the students in the bhajan group and the Veda chanting group. The actual samadhi area had been occupied only by members from Swami's family -a privilege that the Lord has conferred on them! It was about 9:05 am when Swami reached the samdhi. A small procession led Him in and to the glee of everyone present, He was dressed in resplendent yellow! The car halted and as Swami's chair came out, the golden rays of the summer sun kissed His feet and the hem of His robes. It was only after paying salutations at His feet that the sun slowly looked up and gazed at His face! Sunlit, Swami looked so beautiful and sublime. A hush of awe seemed to descend as everyone marvelled His magnificence. Swami slowly moved into the samadhi building, blessing many members of the family of the way. 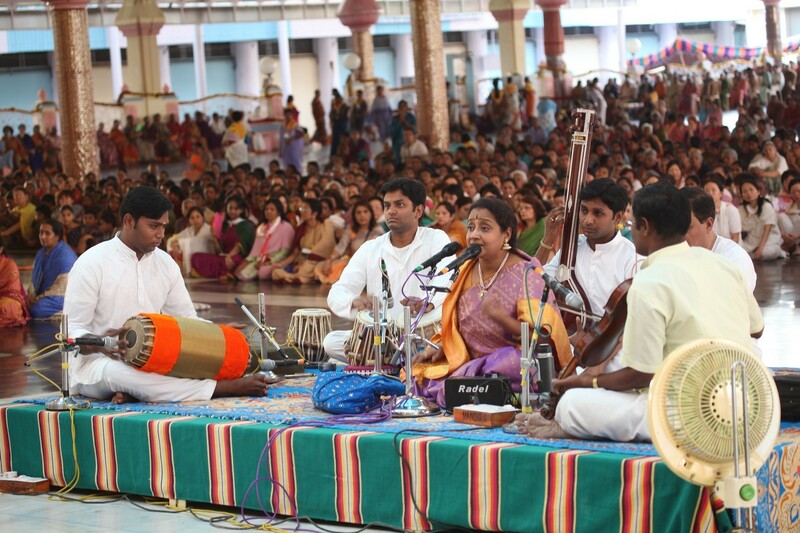 Bhajans on Easwaramma were on continously and the boys sang with vigour and vitality. Once inside, Swami's face suddenly seemed to change and it looked as though the Mother and Son were in a silent communion. Swami's face had that tender emotion and it was hard to tell whether that look of Love was that of a child or of a mother! The story of the relationship between Swami and Easwaramma is so unique. It is hard to tell who actually mothered whom! Swami lit the lamps that had been placed on the samadhi. He blessed garlands to be laid on it respectfully. Then, from a jewelry box, Swami took out a huge golden necklace and asked for it to be placed on the Samadhi of the mother. All this while, the bhajans were on and even though they were being held outside without any ‘mike-power’, they were heard inside the Samadhi building. Whenever the word, Easwaramma, appeared in the bhajans, Swami seemed so moved and touched. All the members of the family who had gathered inside took their turns to fall at His feet and seek His blessings. Two huge garlands were being placed on the Samadhi. But they kept slipping down everytime they were kept. Swami told them to cut the thread that had been knotted to make the garland a complete circle and place the two ends of the thread on the two corners. The garlands now stayed in place. After a wonderful twenty minutes or so, Swami moved out of the Samadhi building, into the car, blessing everyone along the way. As Swami moved along the road, the devotees who had crammed there just to see Him, were so thrilled and excited. They stood on their toes and anything that could lend them some support and more importantly some height, and stretched out their hands as if to receive the abundant Grace that seemed to pervade the very air as the car passed by. Swami moved into the mandir and went into the bhajans hall. There He blessed the prasadam for Narayana seva. Then He moved out on to the stage and sat there. A massive painting of the Mother had been reverentially placed and it made a picture perfect as Swami sat beside it. Well, actually, His chair was placed in the centre, in front of Her portrait. But Swami specifically wanted to be moved to the side. He gave the Mother her due and seemed to want her to occupy the centre stage. Veda chanting was on and soon the prasadam distribution began. Chitraannam (tamarind rice) and sweet pongal were distributed by the efficient Seva Dal volunteers. It is wonderful the way these volunteers work so silently and efficiently. They are subject to various difficulties throughout their day starting with language ‘barriers’ to being taken for granted! But their love for Swami and Swami’s love for them is so immense, that they continue to toil and slog for Him ceaselessly and with all Love. It is no exaggeration to say that we must all daily spend a minute silently expressing our gratitude to these volunteers in our heart atleast! As the distribution went on, Swami received Aarthi and retired for the morning. As announced the previous day, everything had been kept in readiness for the Burra Katha in the evening. Swami arrived in the chair and moved through the entire Kulwant hall granting darshan to the sizable crowd that had gathered there. It is amazing how Puttaparthi with such a sparse population a few days ago was buzzing agog with devotees everywhere, now that Swami had returned. Swami moved towards the interview room. He entered the bhajans hall where the three students who were the artistes of the day were seated. Swami examined their costumes and asked them about their evening’s performance. Looking convinced that everything was in order, Swami moved out to the stage and then called for the artistes to come too. As the mikes were being placed down, Swami asked for the mikes to be brought up on the stage and wanted the artistes to take the centre stage. That was done and then they began, with the wonderful portrait of Easwaramma forming a splendid back drop for their narrative! The Burrakatha began with a prayer to Lord Ganesha. Then it was the Sai Bhagawatham! However much one may attempt to tell the story of Easwaramma or Subamma, one ends up narrating the story of dear Swami, for, it is Swami who makes lives fruitful and wholesome. The story of the divine Mother and Subamma is so inspiring for they were so closely associated with God. The three artistes narrated how the mothers were privileged to witness the divinity of little Sathya. Hailing victory to Mother Easwaramma, the students gave a brief chronology of events in her life. She was born in the year 1890 to Sri Subba Raju. When she was only five years old, the family migrated to Puttaparthi. Her name now finds a place in the list of illustrious mothers of Avatars – Kausalya gave birth to Sri Rama, Devaki to Sri Krishna and Devagiriamma to Shirdi Sai. Swami was born in the Ratnakara Vamsa (clan) to Pedda Venkama Raju and Easwaramma. Continuing their narration, the students said, it was Subbamma, the first wife of Narayana Rao, who named Swami as Sathyanarayana Raju. One day when Subbamma wanted to feed Pakodas to Swami, she saw all the fourteen worlds in His mouth as Yashoda saw in Lord Krishna’s mouth in the Dwapara Yuga. Karanam Subbamma experienced great joy in serving food to the devotees of Swami. Referring to the three wishes of Mother Easwaramma, the students said the present Sri Sathya Sai University, Super Speciality Hospitals and Sri Sathya Sai Ganga Water Project bore fruit due to the humble wishes of Mother Easwaramma. In those days, Bhagawan used to do Narayana Seva to the villagers of surrounding villages when He used to ask Mother Easwaramma to distribute clothes. On May 6th, in 1972, when the Summer Course was in progress in Brindavan, Bangalore, she left her mortal coil. She called out, “Swami, Swami …” And Swami responded immediately. He came to her, and she breathed her last.The Burra Katha artistes said that though 37 years have passed, Mother Easwaramma is still ever fresh in everyone’s minds. Recently in Kodaikanal, Bhagawan inaugurated a Pancha Loha statue (made of five metals) of Mother Easwaramma.The students concluded with a prayer, "Oh Mother! Please return to earth again. Your sojourn here has blessed us with unimagineable bounty." As the students concluded, Swami seemed so overwhelmed and nostalgic. It is said that a pin drop silence is a greater ode to a performance compared to a deafening applause. So it was with Swami sitting almost motionless before calling the students to Him and speaking to them. He did not lavish any presents or gifts but the sparkle in His eye said it all. Then He motioned to Sri B.N. Narasimha Murthy, Warden, Brindavan Campus to announce the names of the Burra Katha artistes – Sri Prabhakar, MA in economics, the main narrator, Sri Arvind Sai, also an MA in economics the student responsible for the comic element and Sri Raghuram, Msc in BioScienceswho assisted in the presentation. Then Swami got announced that the same students would perform again the next on the life of Shirdi Baba. Bhajans were on and after a while Swami received Aarthi. Swami then got it announced that the President of India, Smt. Pratibha Patil, would be arriving to Puttaparthi the next day. It was well past 6pm when Swami retired for the day.